Katie graduated from Middlesex University with a first class honours degree in Veterinary Nursing in 2015. In addition to this, Katie was awarded the College of Animal Welfare Award for her high grades and continued excellence throughout her studying. 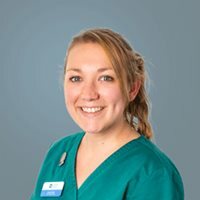 After graduating, Katie worked in a small animal first opinion practice in Berkshire before relocating and beginning her journey as a referral nurse at SCVS in April 2016. For a while, she rotated through all departments at SCVS before finding her roots within the internal medicine department. In 2018, Katie was promoted to senior medicine nurse and has a real interest in immune mediated diseases and endocrinology, and enjoys nursing these cases back to health! Katie is currently studying towards her diploma in Advanced Clinical Nursing and is due to complete this in 2019.